This summer, residents of Plymouth Housing Group participated in a unique Seattle Symphony-led composition experience. Plymouth Housing Group houses over 1,000 formerly homeless individuals in 13 apartment buildings, transforming lives by providing permanent, supportive homes to those experiencing homelessness. Ten residents attended a six-week class where they shared personal stories, explored various thematic ideas inspired by their own experiences, and then considered what those ideas might sound like in music. 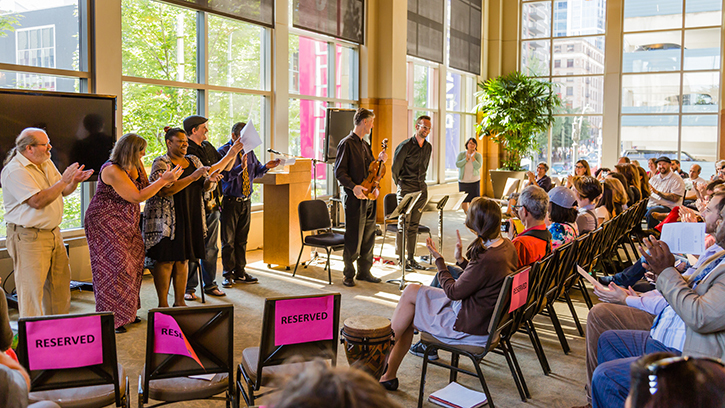 The resulting composition, titled We Are the Art was performed by the participants along with Seattle Symphony violist Wesley Anderson Dyring and Associate Principal Clarinet Eric Jacobs, in a recital on August 4 at Benaroya Hall. Deana Plymale, Housing Case Manager with Plymouth Housing Group, sees the impact that this collaboration has on their residents. The class was led by Seattle Symphony Teaching Artist Lena Console who said, "this has been one of my favorite things to do as a Teaching Artist because I really feel like I've been able to dive more into the community that we're in. Benaroya Hall isn't contained in these walls, our community is bigger and we're going out to them. I get to be in the field, and for me that's some of the most powerful work that I've ever done." For the participants the experience was about more than just the final live performance. According to Rene, "I'm getting to hear other people's stories and getting to know my neighbors — I think it's kinda cool. I went home and I told my son 'I felt musical' and he couldn't stop laughing because I've never felt musical. I felt musical for the first time." Searetha added, "I'm excited to be here. This is truly an awesome opportunity for us to be able to connect with music and be able to tell our stories through music because music is something that unites people." "When we engage someone in art-making, we hear how it changed the way they see themselves and process trauma," adds Laura Reynolds, Seattle Symphony Director of Education & Community Engagement. Thank you to each and every supporter of the Seattle Symphony! Your donations help make programs like Simple Gifts possible. To support the Seattle Symphony’s work in the community, you can give online or call Donor Relations at 206.215.4832. Every gift makes a difference!